How-to create effective learning content using our award-winning methodology! Our brain has an ability to remember embarrassing mistakes on an automatic, involuntary level in order to help avoid repeat failures. Such memories form the foundation of natural learning. However the cost of mistakes at times may make this natural learning process inefficient. These basics however present a great opportunity to instructional designers, if we can create learning scenarios wherein the learners have an opportunity to make all the mistakes they probably would in real life. The key question then is how to identify these key mistakes/ challenges that a learner should encounter in training. 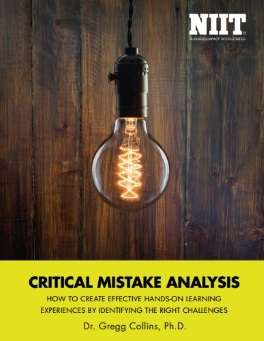 Critical Mistake Analysis (CMA) is a methodology designed to answer this question.